The new 991 series of Porsche 911 has introduced the new generation of the 911 Carrera 4 and 4S. The 911 Carrera 4 comes with the latest version of the active all-wheel drive system PTM (Porsche Traction Management). 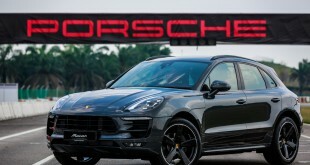 The typical Porsche all-wheel drive with rear-focused layout in this latest 911 version guarantees maximum vehicle dynamics in wider road and climate conditions. 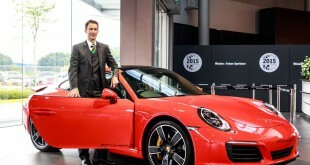 The new Porsche 911 Carrera 4 will make its first public appearance at the 2012 Paris International Motor Show. 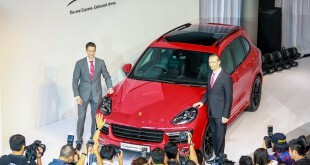 The new 911 models will launch at the end of 2012. The new all-wheel drive 911 is being launched on the market in four versions – as the 911 Carrera 4 and 911 Carrera 4S and each as Coupé and Cabriolet. They sport the same traits as the rear-wheel drive versions: their lightweight body design, suspension, engines and gearboxes are identical, the only exception being modifications related to the all-wheel drive. This means that despite a higher level of engine and driving performance, all four models consume significantly less fuel than the previous models; total savings for individual versions are as much as 16 per cent. In addition, the new 911 Carrera 4 is up to 65 kg lighter in weight. The most distinct identifying feature of the 911 with all-wheel drive is still the wide rear section: compared to the two-wheel drive 911 Carrera models, the rear wheel housings each extend further outward by 22 mm, and the rear tyres are each ten millimetres wider. The traditional red light band that connects the two taillights has also taken on a new form. The new 911 Carrera 4 models have a 7-speed manual gearbox as standard, and the Porsche Doppelkupplung (PDK) gearbox is available as an option. The 911 Carrera 4 Coupé with 350 hp can sprint from 0-100 km/h in as little as 4.5 seconds, 4.7 seconds for the Carbiolet and reach a top speed of up to 285 km/h, while 282/h for the Cabriolet. Fuel consumption with PDK is 8.6 l/100 km for the Coupé and 8.7 l/100 km for the Cabriolet. The Coupé and Cabriolet of the 911 Carrera 4 S each have a 3.8-litre rear-mounted boxer engine that produces 400 hp. The acceleration takes 0-100km/h in 4.1 seconds for the Coupé, while 4.3 seconds for the Cabriolet. The top speed up to 299km/h for the Coupé, while 296km/h for the Cabriolet. Fuel consumption values with PDK are 9.1 l/100 km for the Coupé and 9.2 l/100 km for the Cabriolet. In the new 911 Carrera 4, a new menu in the instrument cluster informs the driver how the PTM all-wheel drive is currently distributing engine power. 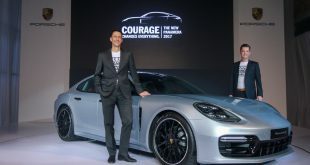 In addition, with the debut of the 911 Carrera all-wheel drive models Porsche is introducing the optional Adaptive Cruise Control (ACC) to the entire model range, which controls distance to traffic ahead and vehicle speed. When ordered with PDK, the ACC system adds the safety function Porsche Active Safe (PAS), which helps to prevent front-end collisions. In addition, Porsche offers a new sliding glass sunroof as an optional feature for the 911 Carrera Coupé. 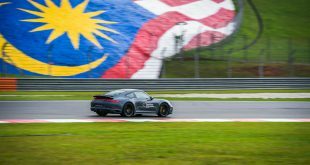 Driving 911 cars with a manual gearbox and Sport Chrono pack can now be even sportier: In Sport Plus mode, the system automatically double-declutches during downshifts. Lastly, the new Carrera 4 and 4S models replace a very successful previous 997-series, of which a total of about 24,000 units have been sold since 2008.